Among the multitude of new timepieces unveiled to the Asian media on the opening day of this week’s Salon International de la Haute Horlogerie (SIHH), the first of Switzerland’s two major annual expos devoted to the watch industry, the Paris-based maisons Cartier and Hermès unveiled new men’s watches that were at once refreshingly different and beautifully executed. Cartier’s contribution comes as part of its Santos de Cartier collection, one of the world’s first-ever wristwatches, which dates back to the first decade of the last century and was re-launched at SIHH last year. This year’s novelties include versions for men and women, but especially noteworthy was a hefty yet incredibly handsome six-hand chronograph powered by a manufacture 1904-CH MC movement and with a re-designed clasp for the bracelet or strap. Of all the new Santos models, however, our particular favourite is the Skeleton Noctambule, whose intricately open-worked chassis reveals a movement of such delicacy that it appears to be constructed more from air than metal. As a final breathtaking touch the bridges are coated with Super-LumiNova, which glows dramatically in the dark. 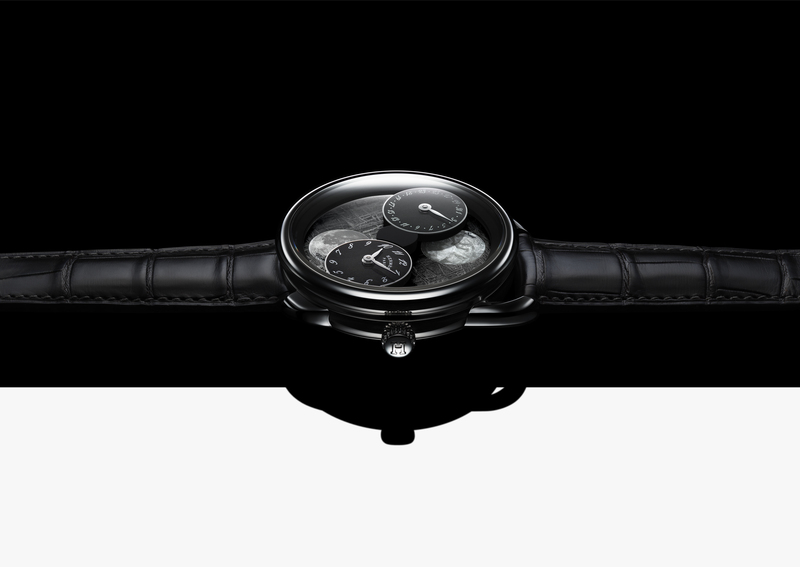 Once best known for its luxury goods with an equestrian twist, Hermès, on the other hand, is increasingly gaining respect for its horological endeavours, and its new double-moon-phase Arceau l’Heure de la Lune must surely count among the most transcendentally beautiful watches ever. Encased in white gold Arceau and with a dial of either meteorite or aventurine, twin discs – one for the time and the other showing the day of the month – appear to float around the circumference as they fully rotate once every 59 days. In doing so, they pass above a pair of mother-of-pearl moons, the south (which bears a representation of the horse Pegasus) at the top of the dial and the north at the bottom. A timepiece that satisfies Hermès twin objectives to be taken seriously in the world of high horology and yet to follow its own idiosyncratic trajectory, the 43mm Arceau l’Heure de la Lune is powered by the maison’s own H1837 calibre that’s modified with a special module. Each version, either meteorite or aventurine, is available in a limited edition of 100 numbered pieces. Either way, we think it’s fabulous.